University Notes: With over 70 years of performances, the FSU Bands are among the most visible performing ensembles on campus. Membership in the bands is open to students who play a band instrument or have the necessary skills to participate in one of the auxiliary units such as flags or rifles. 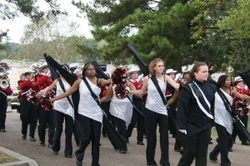 The Marching Band performs at all home football games during the fall semester and at various marching band activities such as parades and festivals. University Notes: The Faulkner University Marching Eagles Band had its debut in the Fall of 2010. The band is experiencing tremendous growth and is currently recruiting members for both marching and concert band for the 2014-2015 season. University Notes: The FAU Marching Band first took to the field in 2005. Marching Band Director Sean Murray directs this icon of the university through performances at every home football game as well as many civic and university events. Membership is open to any student of FAU with prior musical training. 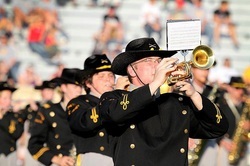 University Notes: The Tiger Marching Band entertains pre-game and halftime audiences at all home Tiger Football games. 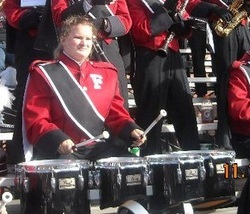 We also march in the annual Homecoming Parade and are the host ensemble for the annual High Plains Marching Festival. With 150 students, from nearly every academic discipline, the Tiger Marching Band has a long tradition of service to the university. All members of this ensemble receive stipends for their services from the Student Government Association. University Notes: The Greyhound Band performs at all home football and basketball games throughout the year. Members of the band also play at the pep assemblies. The band has performed at halftime of the Region VI Championship football game in Wichita and at the C.H.A.M.P.S. Heart of Texas Bowl game in Copperas Cove, Texas. University Notes: During the fall semester the Marching Bobcats perform at home football games and other FSU athletic events. The band is an important part of the FSU community and plays a vital role for the school spirit of the University. They perform music in several styles, including jazz, pop and mainstream marching band charts. The Marching Bobcats is open to University students with previous band experience and has vacancies for all wind and brass instruments and percussion. University Notes: Founded in excellence and maintained by tradition, Furman University’s Marching Band, The Paladin Regiment, has been continually recognized as one of the premiere outdoor performing ensembles in the nation. The marching Paladins have been invited on countless occasions to perform in exhibition at competitions and festivals around the southeast. Composed of around one hundred twenty members, the Paladin Regiment moves like a Division I Drum Corps while including woodwinds, brass, percussion, color guard, twirlers, and the lovely Furman Dance Company. DCI instructors are among the staff and help to make the Regiment look flawless while providing a fun and relaxed atmosphere. “Blast” style moves are employed to make each show unique and exciting for both the crowd and the performer. With original arrangements by Director of Athletic Bands Jay Bocook, the Furman Marching Band sets the standard in musical excellence. The Paladin Regiment achieves the highest level of college performance while still creating a casual atmosphere for its members. University Notes: This spirited student group generates enthusiasm and excitement at all home football and basketball events, as well as taking part in various campus activities. Performing for thousands of spectators throughout the basketball season, the group travels to postseason tournaments each March to support the men’s and women’s teams. This popular organization provides a musical opportunity for all Mason students to participate in promoting school spirit and morale. You don’t have to be a music major to participate— students from any area of study are welcome. 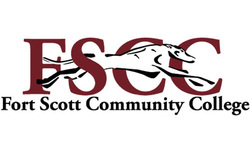 Many scholarships are available to students, regardless of major. Students can also receive class credit for their participation in the band. 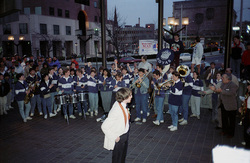 University Notes: The Georgetown University Pep Band is a student musical organization (of about 85 members) that performs at GU Sporting Events as well as other functions (such as the annual Hoyathon, a 24 hour dance marathon). They perform at all home football games, women's basketball games, and men's basketball games. After the regular basketball season is completed, all band members have the opportunity to travel to post season play with the basketball teams. The band plays everything from traditional "pep band music" (Final Countdown) to classic rock (Carry On Wayward Son) to current hit songs (Goin' Down). There are no auditions to join the Pep Band, but there is a basic music proficiency assessment. 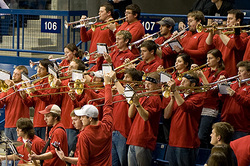 If you are interested in joining the GU Pep Band, please their website. Hoya Saxa! University Notes: It’s a crisp autumn day in Sanford Stadium. The Bulldogs are running off the field to the cheers of over 92,000 fans. There’s a hint of electricity in the air as a massive sea of red and black makes their way to the edge of the sideline. Then, out of nowhere, comes the introduction that many Bulldog faithful come to expect every Saturday in Athens…. “Keep your seats, everyone…the REDCOATS are coming! University Notes: Through 100 years of performance, today's Bullets Marching Band remains one of Division III's premiere marching bands. And with over 100 members, Bullets Marching Band is one of the most visible musical ensembles at Gettysburg College. The Bullets Band performs for 10,000 people each year, including all home football games, the Collegiate Marching Band Festival in Allentown, PA, high school exhibitions and regional parades. All Gettysburg students who perform on a brass, woodwind or percussion instrument as well as visual performers are welcome to join the Bullets Marching Band. The Bullets Marching Band is also one of the largest and most active student groups on campus. Composed of students from almost all majors and disciplines, it combines the best in musical performance with outstanding marching in a fun college atmosphere. University Note: Founded in 1994 by GU student musicians Shawn McGinn, Shawn Griggs, and Sean McKenzie, the Bulldog Band is a university-sponsored club of students organized under GSBA. It has become an important part of the energetic and enthusiastic atmosphere that surrounds the basketball program at Gonzaga. In addition to playing at every Men’s and Women’s home game, the band travels with both teams to local tournaments and to the NCAA Tournaments each March. Gonzaga’s fans are among the most spirited and faithful in college basketball. The Bulldog Band is able to experience the intense and energetic atmosphere at every home game, and come March, many members of the band travel with the teams to NCAA tournament locations across the country. These trips are a blast and often line up with Gonzaga’s Spring Break. Band members are able to explore many cities and landmarks in addition to watching some great basketball! 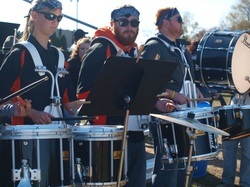 University Notes: The Greenville College band was established in the fall of 2011. Band is a network of potential lifelong friends and colleagues and it increases individual success in college and throughout life. The best part is that GC allows this to be done in a warm and caring Christian environment. We invite and encourage you to participate with us. If you are interested and/or would like more information, please contact us. This is an exciting time, and we would like you to consider being a part of this historic group at Greenville College! 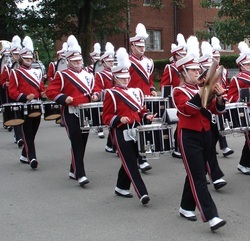 University Notes: The 180 member Grove City College Wolverine Marching Band is called upon to serve as an honor band for many regional marching band festivals, parades, and special guest appearances. The band has been the featured college band on the "Boardwalk" at the Miss America Parade in Atlantic City and in 2001 and 2008 performed guest appearances at Walt Disney World. The college band has also recorded marching band music for Jalen Publishing Company. 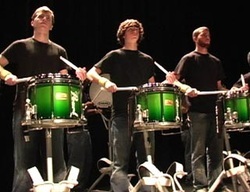 ​University Notes: The Titans Drumline of GTCC is an educational and performance based ensemble open to all GTCC students, area colleges/universities, and high school students. The philosophy of Titans Drumline is to provide an opportunity to support a local demand for such an integral and diverse style of marching arts. University Notes: The Thundering Herd Marching Band performs at all home football games and selected fall exhibitions and parades. Membership in the Thundering Herd is open to woodwind and brass players and percussionists from all majors. The Thundering Herd begins each season with an intense marching band camp on campus prior to the start of the fall semester. During this time students review marching fundamentals, participate in sectionals led by members of the music faculty, participate in music rehearsals, as well as learn the pregame show and the first halftime show. The typical weekly schedule during the semester includes rehearsals from 3:10-5:30 on MWF, an 8:30-9:30 stadium rehearsal prior to the game on Saturday, and the game performance itself. Sectionals are called as needed by each section leader and may include instruction from music faculty who specialize in the corresponding instrument. University Notes: As the ever-present and never-failing supporters of Harvard athletics, the Harvard University Band has filled the stands and the gridiron of Soldiers Field with mayhem, music, and wit since 1919. 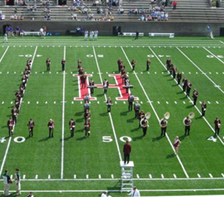 The Band promotes school spirit and tradition, encouraging students and alumni alike to raise song to Harvard at university events. Ever the trend-setter in its field, the Band remains "the best in the business" (The New Yorker). The scramble style of "marching" invented by the Band has become the modus operandi for the Ivy League. 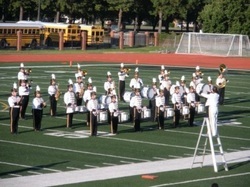 The Band performs at all home and away football games. Throughout the year it can also be seen in action at men's and women's hockey and basketball games, other Harvard sports, and at various university, community, and charity events. With instruments in hand and a commitment to excellence and fun, the Band works hard to bring music and smiles to audiences. The Harvard Band is entirely student-run, from the writing of halftime shows to the arrangements of music to administrative work and financial planning. 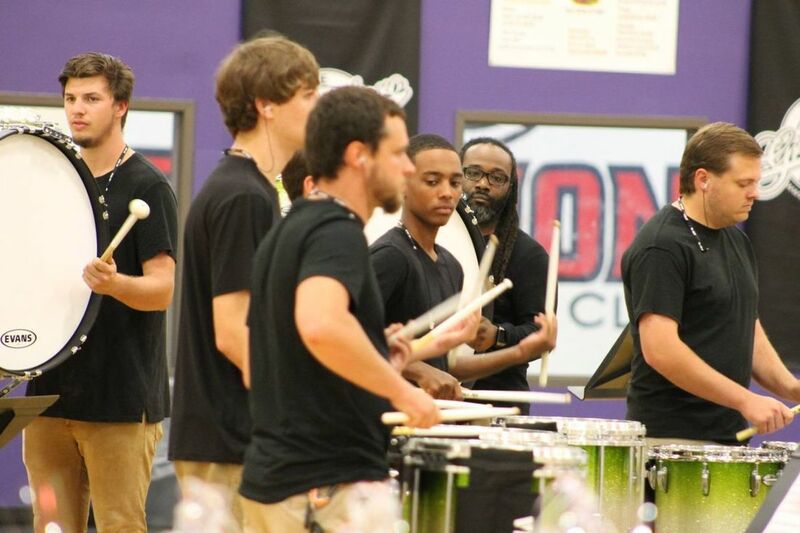 Percussion Instructor: Jeffrey Brown, Jr.
University Notes: The Holmes Community College “Bulldog” Marching Band is a progressive college marching band with entertainment and pageantry as a goal. The “Bulldog” Band has won first place in the Argus Mardi Gras Parade in Metairie, Louisiana, for two years in a row. The “Bulldog” Band performs at all home and most away football games and in various parades throughout the nine county districts. The Band rehearses four days a week for 2 hours after classes on the Goodman Campus. The marching band consists of horn line, percussion, color guard, feature twirlers, and drum majors. University Notes: Formed in 1845, the "Goodtime" Marching Band is the oldest continually running student organization on campus today. The band first began performing at football games in 1910, and since then their role has expanded significantly. They are a cross-section of students who have immense school spirit and a strong camaraderie. During the fall, the Holy Cross Crusader "Goodtime" Marching Band practices during the week (traditionally three times a week for an hour and a half each session) and performs at all home football games as well as select away games. Performances include a pre-game show of traditional HC music, playing pop songs in the stands, the halftime field show, as well as a variety of other crazy antics. One may ask what these (legal) antics are, and the only suitable answer is to come and see them in person. Only then can one truly appreciate the continuous application of Goodtime shenanigans. University Notes: Huntingdon College’s Marching Scarlet and Grey, with plans for a 100-member roster this fall, will have a new practice facility as classes begin in August. Construction, which began last year, will continue in earnest this summer toward a completion date just as students return this fall. The Marching Scarlet & Grey is the flagship of Huntingdon College Bands’ ensembles. It is one of only a few marching bands among Division III colleges and universities. The Marching Scarlet & Grey performs at all home football games, select away football games (with full band travel opportunity), contest exhibitions, parades, and city/state events. As they are open to musicians of all skill levels, there is no audition to become a member of the band. University Notes: Founded in 2009, the Marching Cardinals (formerly known as the Cardinal Band) has already established itself as one of the most visible, energetic spirit organizations on the UIW campus. Comprised of students studying a wide variety of academic majors, the Marching Cardinals perform at every home football game, select performances off-campus, and the annual "Light the Way" ceremony. University Notes: The Indiana State University Marching Sycamores are the University's musical ambassadors, and are one of the most active and visible student organizations on campus. 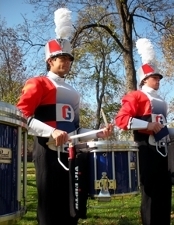 In addition to performing at all ISU home football games, the Marching Sycamores have performed for half time shows at games of the NFL's Chicago Bears and Indianapolis Colts, the Brickyard 400 NASCAR race, National Bands of America Finals, the Mid-States Marching Band Contest, and several other exhibition performances throughout the region. 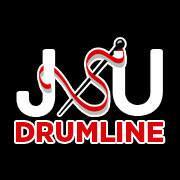 University Notes: : A nationally known entity of Jacksonville State University, the Marching Southerners have been defining the future of marching band for SIXTY YEARS. Comprised of students from all over the country, the Southerners perform for thousands each season sending chills up the spine and tears down the face. With class and excellence, the Southerners extend "The friendliest campus in the South" wherever they go, both on the field and off. University Notes: The Jones County Junior College Maroon Typhoon is made up of more than 200 students representing every major and course of study on campus. The Maroon Typhoon has made numerous nationally televised performances, including the Macy's Thanksgiving Day Parade in New York, NY, King Orange Bowl Parade in Miami, Florida, and the Tournament of Roses Parade in Pasadena, California. Other national performances include the State Street Thanksgiving Day Parade in Chicago, IL and the Veteran's Day National Parades in New York, NY and Washington, D.C.